"We have come from the forest and we worry about what is happening." 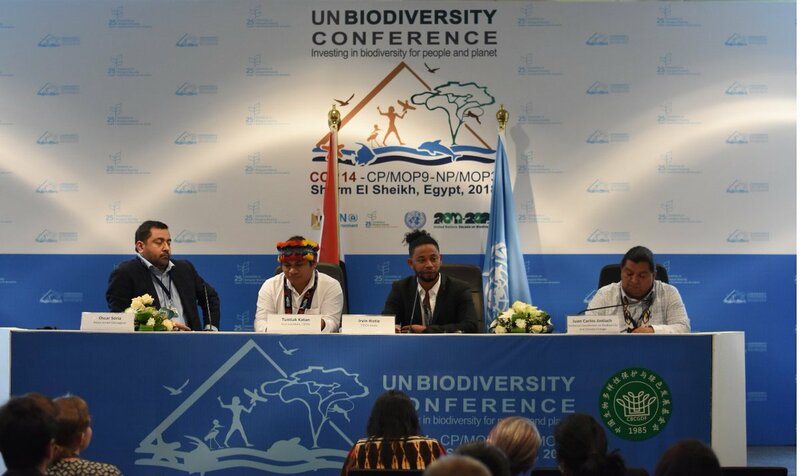 Alarmed by rampant destruction in the Amazon rainforest and the long-term impacts on biodiversity, an alliance of indigenous communities pitched the creation of the world's largest protected area, which would reach from the Andes to the Atlantic Ocean, at a United Nations conference in Egypt on Wednesday. "We have come from the forest and we worry about what is happening," declared Tuntiak Katan, vice president of COICA, the alliance. "This space is the world's last great sanctuary for biodiversity. It is there because we are there. Other places have been destroyed." COICA, which represents about 500 groups across nine countries and is seeking government-level representation at the U.N. Convention on Biodiversity, aims to safeguard a "sacred corridor of life and culture" about the size of Mexico. The alliance hopes to implement an "ambitious" post-2020 regional plan to protect biodiversity in the Andes-Amazon-Atlantic or "triple-A" corridor from agribusiness, mining, and the global climate crisis, but they are also concerned about territorial rights, as they don't recognize modern national borders created by colonial settlers. "Indigenous communities are guardians of life for all humanity, but they are in danger for protecting their forest," Katan said. "We are integrated with nature—it runs through our lives and we need rights to defend it." While fighting for the right to defend the forest from development and the impacts of global warming, the indigenous groups said they welcome opportunities for collaboration. Although Colombia had crafted a similar triple-A plan that was set to be unveiled at next month's climate talks, as the Guardian noted, "the election of new rightwing leaders in Colombia and Brazil has thrown into doubt what would have been a major contribution by South American nations to reduce emissions." Colombia's initial proposal was smaller and focused only on biodiversity and climate. But government enthusiasm has waned since an election in June in which the rightwing populist Iván Duque took power. Brazil was more sceptical but had previously engaged in ministerial-level talks on the corridor-plan. Its opposition is likely to grow under its new rightwing president, Jair Bolsonaro, who will take power in January. Last month Bolsonaro indicated he would only stay in the Paris climate agreement if he had guarantees ensuring Brazilian sovereignty over indigenous land and the "triple-A" region. Bolsonaro's comments about environmental and indigenous issues on the campaign trail "are concerning because they nurture a disturbing tendency in different parts of the world, where almost three-fourths of environmental defenders assassinated in 2017 were indigenous leaders; where opposing agroindustry is the main cause for assassination of our leaders worldwide; and where imposing projects on to communities without their free, prior, and informed consent is at the root of all attacks to indigenous and community leaders," said Juan Carlos Jintiach of COICA. "Likewise, we see that it is increasingly frequent for indigenous peoples and communities to face costly and difficult processes to legalize their lands, while corporations obtain licenses with ease," Jintiach noted, calling on Bolsonaro to obey all laws and ensure the rights and safety of the people of Brazil. Despite the changes to the local political climate, Katan vowed the indigenous communities will keep working to play a key role in protecting the forest. "We know the governments will try to go over our heads," he said. "This is nothing new for us. We have faced challenges for hundreds of years." "Indigenous peoples and local communities are a solution to the devastation of our ecosystems and climate change both in the Amazon as well as in the rest of the world," Katan added in a statement. "But whether policies addressed at mitigating climate change and promoting the restoration of rainforests succeed, depends on the security of having possession of community lands." This post has been updated with additional comment from Tuntiak Katan and Juan Carlos Jintiach of COICA.